The owner of Village NetMedia, Richard Anderson, announced Friday, March 9, 2012 that he has closed all his newspapers effective immediately. The closure means the end of weeklies The Village Soup Gazette in Rockland, the Village Soup Journal in Belfast, the Bar Harbor Times in Bar Harbor, the Capital Weekly in Augusta, and its entertainment publication The Scene. ROCKLAND, Maine — The owner of Village NetMedia announced Friday night that he has closed all his newspapers and related Maine websites effective immediately. The closure means the end of weeklies The Village Soup Gazette in Rockland, the Village Soup Journal in Belfast, the Bar Harbor Times in Bar Harbor, the Capital Weekly in Augusta, and its entertainment publication The Scene. Former links to the news organization’s Maine websites now produce only a letter announcing their closure. “The profound changes in the newspaper publishing business, a weak economy and our investment in new products created severe financial challenges. Over the recent months, I have worked with outside professionals to achieve a financial restructuring that would allow us to continue. These efforts failed as of 3 p.m. today, March 9, 2012. We can no longer sustain our operations,” owner Richard Anderson said in a statement. The company employed 56 people at the time of the announcement. “The company will cease operation beyond that which is necessary to complete the closure process,” Anderson said. Employees were notified by email late Friday, according to two employees. There will be no severance, according to the employees. Village NetMedia purchased the Courier Publications newspapers in June 2008. 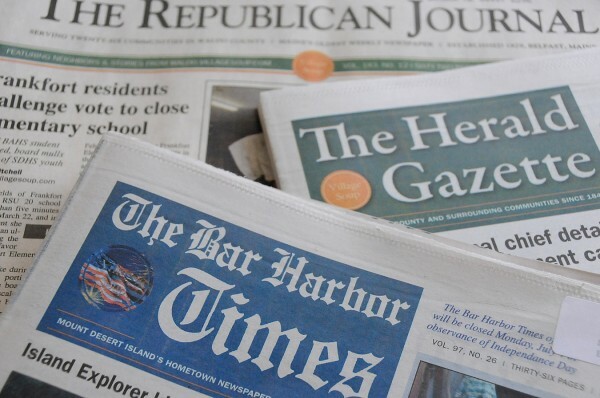 At the time, those papers consisted of the three-times-a-week The Courier-Gazette in Rockland and weeklies The Camden Herald in Camden, the Republican Journal in Belfast, the Bar Harbor Times and the Capital Weekly. In November 2008, the company closed The Camden Herald by merging it into The Courier-Gazette, renaming it The Herald-Gazette and cutting the paper down to twice a week. Last year, the company ceased publishing its Saturday edition of The Herald-Gazette and created a weekly called the Village Soup Gazette. The company also closed its printing plant last year in Rockland’s Industrial Park. The Republican Journal was founded in 1829. The Courier-Gazette started in 1846 and the Camden Herald in 1870. The Bar Harbor Times is nearly 100 years old. The Capital Weekly was started after 1991. Harden, who is a member of the Rockland Historical Society, said he has grown up reading the Courier and believes a newspaper is important for an informed citizenry. “Whether or not I liked what was written, it was important that something was written,” the mayor said. Raymond Gross, who worked for The Courier-Gazette for 33 years and retired in 1991 as publisher, said he is sad to hear of the closure but said he had seen the handwriting on the wall. “I don’t think he [Anderson] wanted to be involved in the print media,” Gross said. He said he understands the difficulties that newspapers are experiencing but that a county seat needs to have a newspaper. The retired publisher said he hopes someone will come in and start a new newspaper. Earl Brechlin, editor of The Mount Desert Islander and a former editor of the Bar Harbor Times, also expressed sadness. “It’s a sad day when an institution of nearly 100 years evaporates,” Brechlin said. Brechlin worked at the Bar Harbor Times in two stints totaling 18 years including 10 years as its editor. Anderson could not be reached for comment Friday night. In June 2008, when Anderson purchased the newspapers, he announced his vision for the publications. “We will transform the way these newspapers do business as well as how they serve their communities, all to the benefit of readers, advertisers and organizations across the region. We will breathe new life into these newspapers by combining energetic local journalism with a forum for neighbors to share their views and a place for local businesses and organizations to serve in new ways,” Anderson stated on the VillageSoup website in June 2008. He founded a website in 1997 and started the weekly Knox County Times newspaper in 2003 and the weekly Waldo County Citizen newspaper in 2004. He closed those papers when he purchased the Courier Publications papers. He also closed the Waldo Independent when he purchased those papers and merged it into The Republican Journal. Anderson, through RMA Properties, sold in January the building at 301 Park St. in Rockland that had been the headquarters of VillageSoup’s operations and Village Soup Gazette. The building was sold to Knox County for $500,000 for the expansion of its public safety facilities. Village NetMedia had until March 30 to leave the building and had not announced a new location. RMA Properties owns the property where the printing plant was located at 1 Gordon Drive in Rockland.